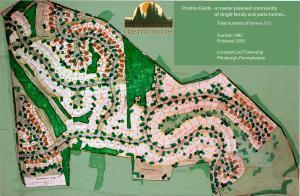 This prestigious master planned community is where J.N.D. Properties is currently building its newest designs of ranches and patio homes. Pristine Fields, located in Cecil Township, Washington County is nestled on a 100 acre site with several ridge tops affording views of countryside and meadows. The site has 30 acres of open space to maximize views, privacy, and individuality of each home site. The extra emphasis on landscaped outside areas including parks, walking trails, and putting greens are there for all residents to enjoy. With the elegant entry and tree lined sidewalks, Pristine Fields has a unique feel and is a community you will be proud to call home. 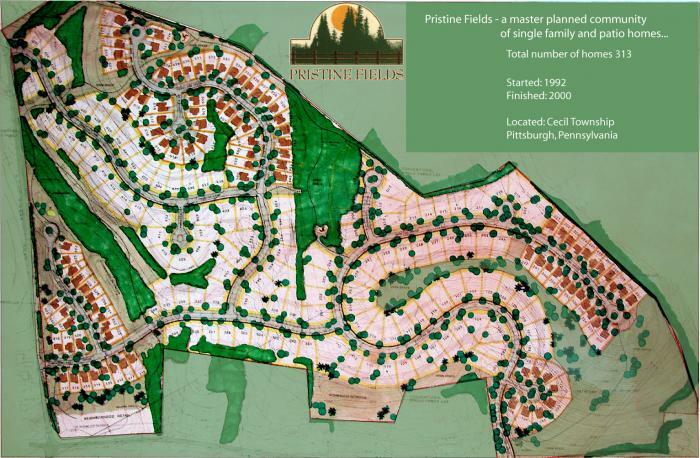 Pristine Fields is ideally located, just over the Allegheny County border, in Cecil Township, Washington County. Only minutes from Interstate 79 South exit 10, on 980 North. Less than one mile from Southpointe. “Donaldson’s Crossroads” at Rt. 19 and Rt. 50 are just minutes away. Reserve a lot online before construction begins and save $1,000. Call 412-221-2725 for the details, be sure to take a tour of the sites above.